The official Apple Events page has been updated in advance of the newly announced media event. Invitations were sent out earlier Thursday inviting members of the press to "let us loop you in." 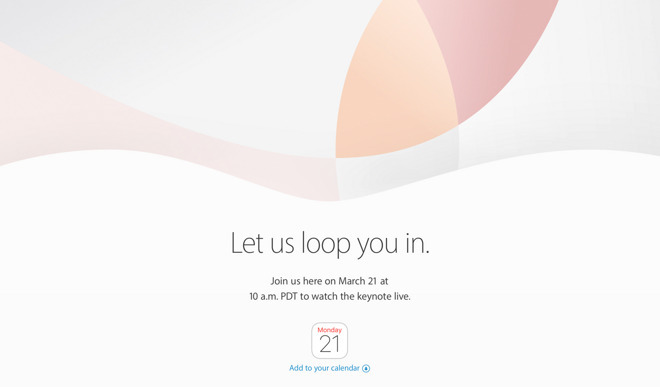 The March 21 presentation uses Apple's HTTP Live Streaming technology. It requires an iPhone, iPad or iPod touch with iOS 7.0 or later. The event can also be streamed from second-, third- and fourth-generation Apple TV set-top boxes. On a Mac, users must be running Safari 6.0.5 or later on OS X 10.8.5 or later, and PC users must use the Microsoft Edge browser in Windows 10. The keynote will kick off that Monday at 10 a.m. Pacific, 1 p.m. Eastern. It will be held at Apple's corporate headquarters at 1 Infinite Loop in Cupertino, Calif. It's possible the presentation could be the last to be held at Apple's current headquarters, as Cook said at last month's annual shareholders meeting that the 1,000-seat theater at Apple's upcoming Campus 2 may open in time for next year's shareholder meeting. Apple is also expected to hold an event this fall, but it will likely be in San Francisco rather than Cupertino, if history is any indication. Apple's March 21 presentation is widely expected to be headlined by a new 4-inch iPhone with A9 processor and support for Apple Pay. It's rumored to be called the "iPhone SE." The company is also expected to unveil a new 9.7-inch iPad with Smart Connector, quad-speaker array and A9X processor. Rumors have suggested it will be named the iPad Pro, just like its larger 12.9-inch variant. Apple's presentation is also expected to mark the debut new bands debut for the wearable Apple Watch. The company also has new MacBooks in the works that could launch at such a media event, as Apple's notebooks are due for upgrades to Intel's latest processors.